Booster for Smash Bros, thank you. I am very excited to play Super Mario RPG today because I’m about to reach my favorite section. First I have to get through a relatively simple boss fight, and then it’s on to Booster’s Tower. Booster is my favorite character in this game, unquestionably, and I support the notion of Booster returning and joining forces with Wario to create utter mayhem. But I’m getting ahead of myself as usual! We talk exercise first! My exercise bike is a pretty simple thing, only costing a few bucks from a local buy/sell Facebook group. I’m not a big fan of the resistance settings though. The basic setting feels a little too weak while the next setting up feels a little too strong for what I want. There is no baby bear’s porridge here, no “just right” setting for me. I’ve made it a point to keep the resistance at the third setting whenever there’s a boss fight though, so tonight begins with the boss resistance! Punchinello is a bomb, technically. He looks like a bomb, is surrounded by bombs, and eventually is crushed by a bomb. He introduces himself as “Nello...Punchinello,” which makes more sense when you realize he was originally named James Bomb. Funny how the writer thought the joke was too precious to remove, even when it no longer technically worked. This was definitely a Ted Woolsey production, but whatever you feel about his localization style, dude worked on some of the best damn games ever, so no shade. Interestingly enough, Punchinello was the first boss I remember fighting as a kid that didn’t give me any trouble whatsoever. I ended up rolling over him then, and I did the same now, easily moving along to nab the third star and begin the minecart minigame. As I mentioned during the Midas River Run, Super Mario RPG is crammed full of minigames, some of which are pretty excellent (everything during Booster’s story arc) while some are just sort of there (Whack-a-Goomba). Riding the minecart is squarely in the middle where I just don’t have a ton of love for it, but I don’t hate it either. Part of that is because it takes a loooooooong time to finish it, or at least it feels like a long time, possibly exacerbated by still pedalling at the boss resistance level on my exercise bike. It also irked me that you see the minecart minigame in the game’s attract mode demo but the way the demo player acts looks impossible for actual gameplay. Thankfully the minecart section ends and the mole children are rescued via crash-landing into a little Mole hut, the second time Mario has crashed through the roof of a house (the first was being flung from Bowser’s Keep and somehow landing perfectly in Mario’s Pad). With the children safe and the danger passed, I can take a step back and acknowledge something somewhat interesting: the third star and all the problems didn’t technically involve Smithy or his gang. It’s never explicitly clear whether Punchinello is part of the Smithy Gang, but it doesn’t seem like he is. He’s just a guy who happens to live in the mines for whatever reason. I just really like that despite Smithy being the big bad of the story, he’s not always the immediate threat. “Beat Smithy” is A goal but not THE goal, which is “collect all seven stars.” An interesting distinction as the objective is to rebuild something, not to destroy someone. After grabbing some items from various Moles, the crew heads to Booster Pass, a relatively short in-between area with a few oddities, the main one for me being the introduction to an enemy meant to troll the character: the Artichoker. These enemies look like the standard shrub in the game, so the first time you jump on what you think is a shrub and start a battle, it’s a comical surprise. “Oh, even the bushes are out to get me!” Weirder still is that during said battle you see what’s inside the shrub, and it’s a wonky fish head that can scuttle around on little roots. It’s probably one of the most unsettling enemies in this game, which is saying a lot. Finishing Booster Pass leads us to Booster Tower and, MMMMMMMMM, I’m so ready. 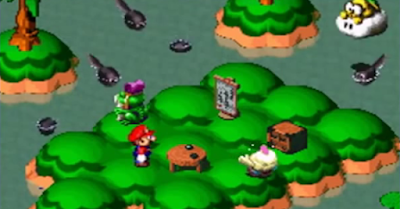 This is my favorite segment of the game filled with some of my favorite moments, and we begin by finding Bowser at the door of Booster Tower, apparently frustrated and alone. We also see Princess Toadstool at the top of the tower, technically bringing the three together again for the first time since the beginning of the game. I love the way Bowser is characterized here. The rest of the Koopa Troop has been run off or defeated, leaving just Bowser to lament his loss. He doesn’t even have the urge to fight Mario when he sees him, instead searching for a way to spin things so as not to appear weak or embarrassed. This leads to Bowser busting in the door to Booster Tower and joining our party. Part of why I like this section is that I now have a fourth party member to choose from, allowing some strategy in team setup. Mario is the all-arounder and mandatory, while Mallow is the magic user and Geno is the guy who can shoot bullets from his fingers. When Bowser enters the picture, you get the beefy tank, and the ability to make a team of heavy-hitters who prioritize dealing damage rather than healing. I always run my team of bruisers through Booster Tower. The first floor sets the odd scene with Snifits all over. Most are blue, but there are three grey Snifits that act as Booster’s main cronies. The first one stands at a reception desk and acts as an optional fight that is hard to resist. The first floor also has muzak like the lobby of a highrise building, adding to the beginning unsettling aspect before going full-on bombast. As soon as we head up a level, we’re greeted by Booster himself, a character that looks like if Wario was a member of the Loyal Order of the Water Buffalo. He’s got a big shaggy beard and enters on a train, cutting the music off to greet Mario before Booster’s main theme kicks in and the insanity really begins. Booster Tower is a lot of weirdness, both in enemies and level concepts. At one point we get a new hammer weapon for Mario by going up a few levels and jumping down to the first floor in the correct spot on a teeter-totter to get flung back up into a chest. This little jump is deceptively difficult due to the weird 3D platforming that I’ve mentioned before and it used to take me multiple trips back and forth to get it right. This time, got it first try. Booyah! There’s a room where Snifits float down from parachutes, a room with a blast shield you can hide behind while Booster throws bombs down at you, a room with boobytrapped floor tiles, and a short puzzle where you have to select the correct order of Boosters from the first generation to the sixth, with the current Booster being the seventh, apparently, which just raises further questions! Actually, that little puzzle gives you one of the most satisfying rewards. You get a key to a room right next to you and upon entering you see a Chain Chomp stuck on a brick. When you try jumping on it for a battle it instead barks at you, prompting Bowser to pop out from Mario and share a moment with the Chain Chomp. He then jumps over to her (yes, he knows it’s a female Chain Chomp somehow), and asks Mario to turn around as she’s shy. When we turn back, Bowser has unhooked her and says she’d like to be part of the team, giving Bowser his first weapon. This scene does so much to deepen Bowser’s character and show that he’s not just some evil big bad but someone we can sympathize with. 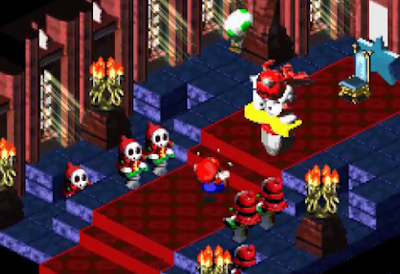 We keep getting moments like this throughout Super Mario RPG, which is why it’s one of my favorite games. Of course I can’t mention Booster Tower without also mentioning the room with a curtain in the corner. If Mario walks behind the curtain, he’ll change into the 8-bit Mario sprite from the original Super Mario Bros., complete with period-accurate music. There is absolutely no point to this, no special reward or further secret. It’s just good fun. Trying to exit the room shrinks Mario and sends him in a panic back behind the curtain, returning once he’s back to normal. Yeah, Booster Tower is weird. As are the enemies. Snifits and Rob-Ombs (no, NOT Bob-Ombs) permeate most battles, with Jesters, Remo Cons, and Orb Users rounding out some of the weirder aspects. You find yourself making more strategic moves, deciding which enemies to attack first and how to split your efforts when attacked by large groups. It’s definitely one of my favorite places to power level, though for this playthrough we’re just heading on through. I save near the top since I’m nearly an hour into the session and decide to postpone the rest of the Booster arc for next time. Make sure to come back soon because we’re headin’ to a weddin’!